The Plague Dogs, A Novel. "For we are free---free to suffer every anguish of deliberation, of decisions which must be made upon suspect information and half-knowledge, every anguish of hindsight and regret, of failure, shame and responsibility for all we have brought upon ourselves and others: free to struggle, to starve, to demand from all one last, supreme effort to reach where we long to be and, once there, to conclude that it is not, after all, the right place." The character of Snitter in this book, a fox terrier,is one of the most sympathetic, tragic, and moving protagonists in any novel I've read published since 1977. This is not hyperbole. The long section of Snitter's monologue about his deceased "master" who died in an accident is moving and heartbreaking. 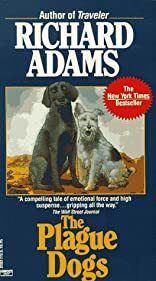 Adams does a masterful job at getting into the heads of the two main dog characters and doing so in a believable way quite unlike in tone from his more famous rabbit characters in Watership Down. There isn't anywhere near the whimsy of that novel, but to use the word "realism" seems strange in connection with dogs who talk with one another...but there you go. Adams has created two canine characters with actual, well, humanity. A remarkable work. And I'm actually a cat person! 1/15/2008 becca thorne said: A brilliant and tragic story based around two dogs escaped from a research laboratory trying to get home across the moors. Too good for words.